The LGA Special Projects Award recognizes attorneys who have contributed to an LGA project or other project of particular importance to LGA or local government generally. Its purpose is to encourage greater service to LGA or local government and to honor members whose projects have proven to be especially effective and successful. 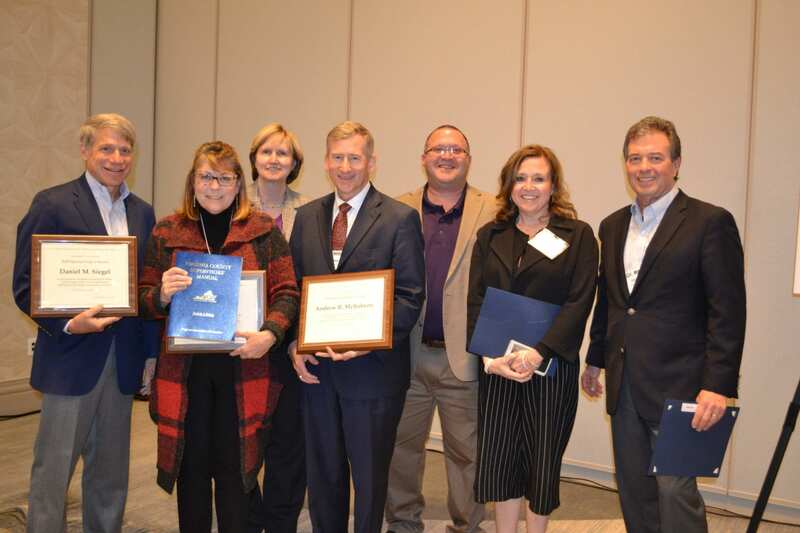 For Spring 2019, LGA is pleased to present the Special Project Award to the 45 local government attorneys who participated in producing the Eighth Edition of the Virginia County Supervisors Manual published by VACo. Local officials have an increasingly difficult job that requires knowledge and understanding of many different issues in order to fulfill the duties of the office. Providing these local officials with the tools to understand these issues is an important task. One extremely helpful tool for local officials is the Virginia County Supervisors Manual published by VACo. This manual is used by local public officials throughout the Commonwealth as a guidebook or encyclopedia of local government. The manual is designed to assist county supervisors and other local officials with the performance of their duties by focusing on the most important topics that pertain to local government governance. The manual includes 20 topical areas and over 400 pages of information providing an overview of the powers and duties of local officials in Virginia. This Eighth Edition was a revision of an edition published in 2006 and includes the work of 45 local government attorneys. Many changes have taken place in the 13 years since the last volume was published and countless hours were spent by these attorneys to research and write the current edition. Phyllis Errico of VACo, and Dan Siegel and Andrew McRoberts of Sands Anderson PC, coordinated the update of the manual and spent many hours making this project happen over the course of this past year. Joining them in this effort was the local government group of Sands Anderson PC, in conjunction with an additional 24 dedicated members of the Local Government Attorneys of Virginia. The contributors are listed below, and this monumental project could not have been completed without the contributions of these attorneys who gave of their time to produce this important reference manual for local government officials.